Jackson’s Boat is a dog friendly pub near Manchester – dogs are most welcome. 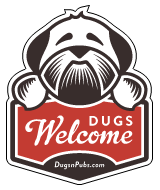 Fresh water is always available and doggie treats are available from the bar. We also sell dog beer! During the Summer we run a series of fun dog shows. Hand crafting excellent coffee from Tib Street, the Northern Quarter, Manchester. Loose-leaf tea, grilled cheese sandwiches, soup, salads and sweet stuff. There are a total of 24 dog friendly listings in the Manchester category. Please log in, or sign up as a member to view all listings.